In the 17th and 18th century the Kirk was a very important institution in monitoring how people conducted their day to day lives and it interfered in a way we would now find unacceptable. It did however, do a lot of good in the community by giving small pensions to people who were unable to work through age or disability, paying school fees for a child whose father had died and by trying to ensure that the father of an illegitimate child took responsibility for its upkeep. As the arbiters of morals in the community, the Kirk Session Minutes contain a large number of cases of fornication and children born out of wedlock. Occasionally, there are cases where there is a dispute about paternity of an illegitimate child or whether fornication has taken place and some of these can be as entertaining as a soap opera. The Session normally met each week and on Thursday, 13th July 1752 the Moderator informed the Session that one of the elders had given a report of “flagrant and scandalous behaviour” on the previous Friday between George Wilson, a farmer in Knockhouse (Knockhouse farm is now part of Crossford) and Isabel Watson, the widow of Peter Shorthouse, who was the late gravedigger in Dunfermline. The Moderator had therefore cited both George and Isabel to appear before this meeting of the Session. Isabel Watson admitted that George Wilson was in her house on the previous Friday, as he puts his horses in her stable, and he had sent for a choppin of ale (a choppin was a Scots measure equivalent to 2 pints) and a gill of whisky (a quarter of a pint) which he and she drank together. She also said that despite there being no other person present, the full door and the half door were open and there was no indecent behaviour between her and George Wilson. George Wilson stated that Isabel Watson had required a firlot of oats (a Scots dry measure equivalent to around 31pints) for the privilege of putting his horses into her stable and he had gone into her house and sent for ale and whisky. He also stated that the doors were open and that there had been no indecent behaviour between him and Isabel. Although there is no indication in the Minutes of any previous suspicions of indecent behaviour between George and Isabel, it would appear their liaisons were known in the neighbourhood. The case was brought to the attention of the Session by Isabel’s stepson Charles Shorthouse who had taken over from his father Peter as gravedigger (Charles later became a Beadle at the Abbey). As soon as George had entered Isabel’s house, a neighbour ran to fetch Charles and he and some other residents of the town ran to Isabel’s house, presumably to catch them in flagrante delicto. 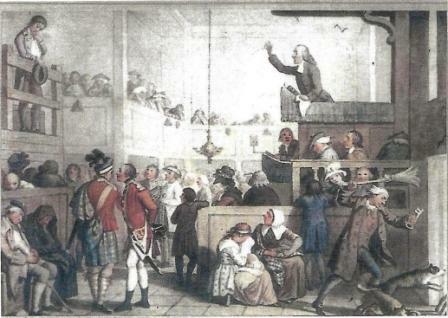 Charles Shorthouse was also present at this meeting of the Session and claimed he could prove there was bad behaviour between George Wilson and his stepmother and he named several people he could call as witnesses. In fact, he named seven witnesses who would be willing to testify. George and Isabel were cited to appear before the meeting of the Session which was held on August 7th. Neither of them turned up but a messenger gave a paper signed by George Wilson giving reasons why he did not turn up and why the witnesses could not be examined that day. All the witnesses had turned up along with another two not named at the previous meeting. These were two of the people who had accompanied Charles Shorthouse in his dash to Isabel’s house. George and Isabel along with the nine witnesses were ordered to appear at the next meeting. The first episode of the drama is now over. It is obvious that Isabel and her stepson, Charles, do not get along, but is he being vindictive in trying to shame Isabel when she has done nothing wrong, or is he an upright elder of the Kirk who is trying to prevent his stepmother bringing shame on the family? At the meeting held on 20th August, 1752 both George and Isabel turned up and George produced a legal document which listed the names of all the people who had been cited to appear that day as witnesses against him. The document stated that these witnesses would be guilty of slander and defamation and that if the Session heard them they would be liable for costs and damages. George Wilson then left the meeting as he had to return to the harvest. 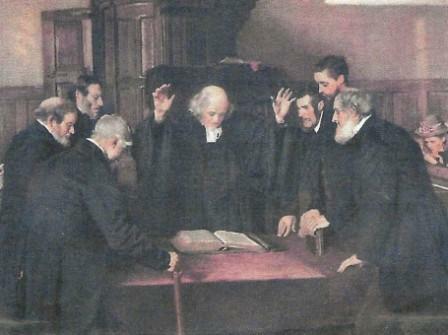 The Session rejected the document given by George and proceeded to examine the witnesses. The majority of the witnesses were in the house above that of Isabel Watson. This house was occupied by James Turnbull who was deacon of the corporation of tailors in Dunfermline, his wife and their three female servants along with two visitors. All of the people in James Turnbull’s house were aware of George Wilson being present in Isabel’s house and made good use of two or three holes in the floor through which they could see into Isabel Watson’s house. These witnesses appear to have taken turns looking through the holes in the floor and gave similar accounts of what they saw. These graphic descriptions would have been enough – depending on his disposition – to make the clerk of the Session either blush to the roots of his hair or salivate! One of the witnesses, Margaret Gullen, said she stopped looking through the hole in the floor as she could not look upon them any longer as she understood “they were about the act of uncleanness”. Margaret could be forgiven her modesty as she was only fifteen years of age. Isabel had to listen to all these witnesses giving their testimony and the Moderator now asked her to tell the truth. Surely, Isabel now has no option but to confess. She stated that George Wilson made attempts upon her chastity both by his words and actions but persisted in saying that she was innocent, having resisted him and not complied in any respect or degree; she added she was bewitched by him. The Session delayed consideration of the affair until the next meeting and in the meantime appointed a committee of Mr Fernie (the Moderator), John Angus and John Ker (Elders) to look at the evidence and report. On October 12th the committee reported and their unanimous opinion was that George Wilson and Isabel Watson ought to be censured for guilt of “uncleanness with one another”. The report was accepted by the Session and the Officer was ordered to cite George and Isabel to the next meeting. Both George and Isabel turned up to the meeting held on October 19th 1752. George admitted that he had been guilty of “unseemly carriage” with Isabel Watson as after having 2 pints of ale and a dram he didn’t really know what he was doing but that he had “no carnal knowledge of her”. Isabel stuck to the same story as before and also claimed that George had “no carnal knowledge of her”. The Session decided that they should both be rebuked before the congregation for their “uncleanness” with one another. The usual outcome of having been found guilty of fornication was that the culprits had to appear before the congregation on the stool of repentance on at least three occasions when they would be rebuked for their offence by the minister. Not turning up when called could result in ex-communication from the church. Isabel was ordered to appear before the congregation on Sunday, 29th October but she did not turn up. George was ordered to appear before the congregation on Sunday, 5th November but he also did not turn up. Isabel eventually appeared before the congregation on January 21st 1753 when she was rebuked and dismissed. This was unusual, as someone found guilty of “uncleanness” would normally be on the stool of repentance on more than one Sunday. Also, there was no mention in the minutes of George being cited again to appear before the congregation. In fact there is no mention at all of George after the 21st January when Isabel was rebuked before the congregation. How did George get out of being on the stool of repentance? Why did Isabel only have to appear once? It is like reading a novel where the last few pages are missing. Normally, the only way to escape the wrath of the Session would be to leave the country or to die and it would seem the latter was the fate of George Wilson. Through the activities of George’s sons, who appear to have followed in their father’s footsteps (not just as farmers), more information about George was discovered. In January 1751, Adam Wilson admitted to being the father of an unborn child whose mother was unmarried. In the Minute, Adam is described as the lawful son of George Wilson of Knockhouse. If George was the father of a grown up son then he could not have been a particularly young man at the time of his affair with Isabel. Also, George was accused of fornication, but if he had been married he would also have been accused of adultery. We can therefore assume that in 1752 George was a widower. In April 1761, William Wilson is accused by a lady called Margaret Lyal of being the father of her unborn child and the minute describes William as the son of the deceased George Wilson farmer in Knockhouse. William denied being the father of the child and he was acquitted because Margaret Lyal was found to be “of previous bad character”. Less than a year later, in February 1762, William was accused of fathering another child. The mother was called Grizel Anderson who was a servant in the house of his brother John, who was now running the farm. This time William admitted his guilt and eventually he married Grizel. What about Isabel Watson. She had married Peter Shorthouse in 1834 and had two children in the 1830’s. We can therefore assume that Isabel was not a young woman when she was having her liaison with George but as Isabel does not appear in any future Session Minutes it would seem she went on to lead an uncontroversial life.